Kevin: I think this episode does a good job of piling on. It makes sense, given the title. The last episode really cranked up the stakes, and now we get a look at this new, more chaotic, new normal. I think the most successful element of the story is Kira, Odo, and Garak going to help Damar's rebellion. It makes practical sense. Kira is literally an expert on this kind of warfare. Garak's interest and Odo's skills are self-explanatory. On top of that however, is some top notch dramatic complications. Damar must bristle at the idea of Federation help, and Kira, as she reminds us, has little love for Damar. I loved the scene of Sisko shutting her down on that. The stakes are bigger and everyone knows it. The story also goes interesting places once they are there. The question of whether or not to kill Cardassian soldiers, or even Cardassian civilians is a difficult one. 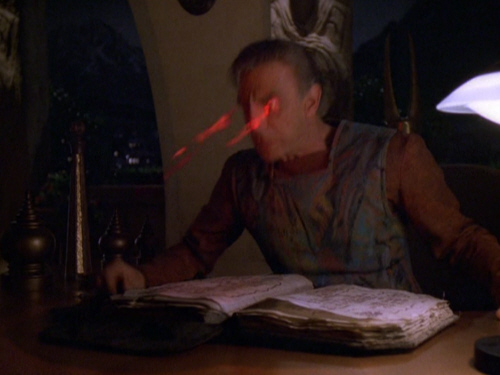 Damar and Rusot's resistance is understandable, but Kira's response is as accurate as it is brutal. All of this serves to make the Cardassian resistance a real, interesting thing. Rebellions are not pretty and heroic. They involve impossible choices. Not everyone agrees on everything, from goals to methods. What we are left with a bunch of interesting people with their perspective and the clash bears fruit almost immediately. Matthew: Even if it weren't successful (it is), this story thread brings Garak back into the limelight, which is reason enough to cheer it. He is interesting as a character, someone who has been away from his world for so long, and now has a chance to impact events again at the moment of greatest chaos. Will his story thread ultimately be satisfying? Hmm. Either way, it's great here. Probably the best aspect of it all is that it gets these three characters off the station, which has become a rather dull place during this story arc. I found the story idea of Rusot sticking Odo's collaboration to Kira... interesting to say the least. I've never been a fan of their pairing, and this makes it even more queasy to watch. She should hate him for so many reasons (temporal genocide, to name one), and they are fundamentally unlike one another. Kevin: The Dukat/Winn plot is in a bit of holding pattern, but that's not a bad thing. A lot happened last episode and if you don't want to burn out the story before the finale, it will occasionally be at a simmer, not a boil. It's more character work than anything, but with characters like these, I'm not mad, are you? Winn feigning concern for Solbor and Dukat getting a little comeuppance is delightful even if it doesn't really advance things. Matthew: I think they had to give us at least a scene following up on the last episode, given that the Pope of Bajor murdered a Bishop. I agree that this is basically just marking time until later episodes give us more. But indeed, it's still fun to watch. Kevin: Gowron. Hmm. I will give them credit for a novel source for another wrinkle. From the beginning, Gowron was painted as more a crass politician than warrior. Threatening K'ehleyr in TNG, disowning Worf again in DS9, so it's not it of nowhere. The idea only the Klingon fleet could withstand the Breen was a little on the nose, but on the strength of the acting and watching Martok and Worf freak out is pretty fun. Matthew: Yeah, I think this is a consistent portrayal of Gowron. Is it obvious where this is going? Probably. But bits of obviousness isn't necessarily a bad thing when it comes to storytelling. Based on their established characteristics and the overall situation, it's obvious that Martok and Gowron are heading for a confrontation, and it's pretty clear where the writers' loyalties lie. Kevin: The Section 31/Changeling virus plot is the least successful for me. It felt the least organic in terms of complicating things. The bureaucratic scenes with Starfleet didn't quite land and the slightly tortured timeline for the infection pulled me out of the story a little. Matthew: It's going to lead to an episode I enjoy, so there's that. But yeah, giving Doctor Bashir a chance to rail against the inequities of this or that is almost never a good idea. I think less yelling and more reasoned debate would have made the question more interesting. I almost thought O'Brien was going to play Devil's Advocate, based on Colm Meaney's line readings, but sadly it was not to be. Kevin: The scenes on Cardassia really popped across the board. Nana Visitor nailed a balance between being a little menacing but also professional that I really liked. Biggs did a great job clearly trying to balance the fifteen different interests he has to balance as the head of a political movement. Vickery did a great job being an archetypal Cardassian, too. He just bled smug onto the screen. Matthew: I found Visitor's crate kicking to be a bit on the non-believable side of things. I think the stars of this plot thread were Biggs and Andrew Robinson. It's really admirable what Biggs has done, going from convincing self-recriminating drunk to convincing emerging leader. Robinson is his usual smarmy self as Garak, but gives teeny little hints at his character's motivations. Kevin: Robert O'Reilly and his bug eyes are always a treat. There was a neediness in his performance that sold the political undertones, and Hertzler and Dorn played well off of it. Fletcher and Alaimo did their usual great job with Winn and Dukat. I could watch her evict a blind Dukat every day all day. Matthew: Yep, the emotional undercurrents of Kai Winn are a never-ending source of interest and entertainment. Louise Fletcher is excellent here. Watching her toy with Garak, a sly little smile on her face... I think our Klingons did the best they could with what they have, but their lines and scenes were not necessarily the most interesting or revealing of inner character. Gowron came off as just a bit incompetent, which is not how I remember him from TNG, as a consummate schemer who just might have a larger goal in mind as well. Kevin: This wasn't an effects heavy episode, but it made up for it in diversity of set pieces and extras. The Kai's office on Bajor is always great. The caves for the Cardassian resistance felt expansive and the few consoles were fun and the set was populated with the right amount of extras. And the Klingon party scene was practically bursting with surplus Klingons. All in all, it left the impression of a full, diverse universe that the story was taking place in. Matthew: The Bajor matte paintings were superb, especially the night time ones. The planet the Cardassians were holed up on is also perhaps the best-looking CGI planet we've gotten so far in Trek. Kevin: I also want to say that Nana Visitor's Starfleet uniform is extremely flattering, and like Troi, they should have gotten there a long time ago. Kevin: I think this is a solid 4. It's resetting the board for the next part of the show's final arc. It has to capitalize on what has come before while trying to introduce something new, and especially as it pertains to Damar's rebellion really succeeded. The dramatic interest that crested in "Changing Face of Evil" doesn't feel diminished in this episode. Matthew: I agree with the 4 for a total of 8. This didn't really feel like a letdown at all to me. It progressed the various plots that are afoot, but by no means lost any of the forward momentum. It also got characters into more interesting positions and situations, which will bear fruit later on. The caption I would have put under that picture is, "Pew. Pew, Pew, Pew!"